Welcome to the Best Strawberry Vape Juice Flavors 2018 blog list! 2017 has passed and 2018 has arrived! E Cigarette Empire is making blog lists to answer some of the most popular asked questions to help navigate the vaping waters of 2018! This blog list will feature some of the best tasting premium strawberry vape juice flavors going into the New Year. Please keep in mind that these flavors are in no order due to everything simply being an opinion! Strawberry flavored e juices are one of the most popular flavors in the community. Strawberry by itself is very delicious but it also easy to be complemented which makes it a very versatile flavor. It can be paired with almost anything and still be extremely tasty. Some of the world’s most sought after vape juices are strawberry based and a lot of e juice brands broke through with a strawberry based e liquid. With that being said, fill your tank and kick back! The Best Strawberry Vape Juice Flavors 2018 is here and you are bound to find some new all day vape flavors as well as e juice brands! Anything that is featured in this blog list is carried here at E Cigarette Empire right now! Strawberry Killer Kustard by Vapetasia 100ML is one of the most popular strawberry vape juice flavors going into 2018 and fully deserves to be featured on this Best Strawberry Vape Juices Flavors 2018 blog list! 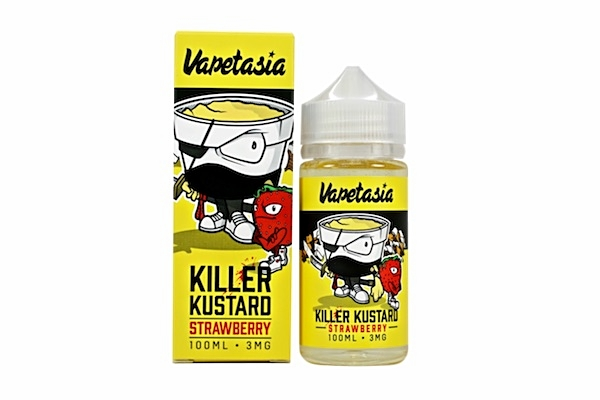 Strawberry Killer Kustard was released by a famous e juice brand called Vapetasia in mid 2017. It is a strawberry variation of the original flavor, Killer Kustard. Since its release, it has been flying off of the shelves here at E Cigarette Empire and is one of the best sellers overall. Not just in the strawberry category. Strawberry Killer Kustard has the flavor profile of a delicious custard that has been infused with juicy strawberries. Both the inhale and exhale are full of extravagant flavor while maintaining an excellent throat hit! Vapetasia is an e juice brand that has the reputation of producing some of the world’s most popular modern day flavors. They absolutely killed 2017 and we can only imagine what is instore for us with the New Year! Be sure to check out our E Juice Brands page where you can find the Vapetasia section and see the rest of the awesome flavors that we currently carry by them! Pink Squares is another strawberry flavor to talk about here on the Best Strawberry Vape Juice Flavors 2018 blog list. Pink Squares by Candy King was released in late 2017 and is one of the most sought after flavors overall with the start of 2018. Pink Squares is one of three new releases from Candy King and it has proven itself to be one of the most delicious strawberry flavors in the game today. The other two new releases are Lemon Drops, and Peachy Rings. It has the flavor profile of delectable strawberry chewy candy that will have your mouth watering like a waterfall. The inhale is a pure burst of strawberry flavoring while the exhale is more aimed towards the soft candy sensation. The exhale complements the fruity inhale perfectly and really ties this profile together completely. Candy King is one of the few e juice brands that have mastered the candy vape juice flavor profile and they have the reputation of producing some serious flavors. They are one of the most popular brands here at E Cigarette Empire. Make sure you check out our E Juice Brands page where we have a Candy King section so you can see all of the products that they have to offer! Remember earlier when I said that strawberry is a versatile flavor? That is exactly why Red by The Milkman Heritage 60ML is being featured on the Best Strawberry Vape Juice Flavors 2018 blog list. Red has a very unique yet delicious flavor profile of juicy succulent strawberries blended together with a rich tobacco mix. Now if you ask me, that is one of the most unique flavor profiles that I have ever heard of and The Milkman has done an amazing job at executing it. The inhale focuses more on the rich tobacco flavor aspect and will have your taste buds tingling with joy. Upon exhaling is when the strawberries weirdly complement the tobacco inhale. The inhale/exhale taste is very complex which greatly appeals to the taste palate. This premium vape juice flavor will taste delicious to anyone! Heritage is a tobacco flavor line from the e juice brand The Milkman. The Milkman has been around since the beginning of vaping and we have carried their flavors since the birth of E Cigarette Empire. Be sure to check out our E Juice Brands page where we have The Milkman section so you can see the rest of their flavors that we carry! Brace Face by Geeked Out 60ML is a prime example to be on the Best Strawberry Vape Juice Flavors 2018 blog list. Brace Face by Geeked Out is a new flavor that released right before 2017 ended and is gaining a lot of hype with the beginning of 2018. It has the delicious flavor profile of strawberry, mango and peach. This tropical fruit mix is sure to have you hooked from the very start. The inhale is more of a strong mango and peach sensation while the exhale is more focused on the delectable strawberry flavoring. These three fruits work wonders together whether it is in a bowl or in an e juice bottle and we all know that. For those of you do not know, Geeked Out is a brand new flavor line from the famous vape juice brand Bad Drip Labs. Geeked Out consists of three flavors right now; Brace Face, Snot Shot, and Drok Breath. All three of these flavors come in 60ML bottle sizes and you can find them here at E Cigarette Empire. Do not forget to check out the Bad Drip Labs category to see the rest of the premium e juice flavors that they have to offer! Milk of the Poppy by Vapetasia deserves to featured on any Best Strawberry Vape Juice Flavors 2018 blog list that has even been published. Milk of the Poppy is one of Vapetasia’s newest e juice flavors and it really harnesses the true powers of the strawberry fruit. It is one of the most popular and loved liquids going into 2018. With the famous flavor profile of strawberries and cream, you really can’t hate! The inhale is has the strong sensation of fruity strawberries with the slightest cream undertone which really mixes these flavors together perfectly. Upon exhaling it is quite the opposite as far as the major flavor goes. The exhale is mostly cream with a slight strawberry undertone so overall these flavors tie together very well. Milk of the Poppy along with all other of Vapetasia’s flavors are carried in 100ML bottle sizes with nicotine levels of 0MG, 3MG, and 6MG here at E Cigarette Empire. Make sure that you swing by our E Juice Brands page and stop at the Vapetasia section to see all of the other delicious flavors that we carry by them! You are sure to find a new favorite!